Rhabdomyosarcoma (RMS) is a rare childhood cancer. Dr Marc wants to find out which genes make children more likely to develop it. Knowing this will help us to identify children who have this cancer earlier, and begin possibly life-saving treatment sooner. This project is looking at RMS, and genetic factors that mean certain children are more likely to get it. If we can learn this, we may be able to treat and cure more of them. Meet Elliott - one of our hero patient stories! Rhabdomyosarcoma (RMS) is rare, with only about 70 children in the UK diagnosed each year. But it’s also hard to treat so is a major cause of childhood death from cancer. RMS can affect almost any part of the body, as it develops in muscle tissue. We find it most often around the head and neck, the bladder or the testes, but it can also be found in the muscles of the arms or legs, or in the chest or abdomen. Our project is looking at inherited genetic factors that make children more likely to develop RMS. This could help us to spot it earlier – and earlier diagnosis and therapy may help us to cure more of the children who develop it. Whatever we can learn about the development of RMS and how to diagnose it early on is vital to improving the survival rate for children. Although very rare, RMS is proportionally more common in children under the age of five. With such young patients, identification and diagnosis is much more difficult, as symptoms can be hard to recognise early on. As with any cancer, early diagnosis can improve survival rates, so new ways to identify and treat RMS are essential. Dr Marc and his team have worked with the national childhood cancer tissue bank to collect samples. In total, they’re able to study normal (blood) DNA and/or tumour samples from more than 200 children with RMS. Having both normal and tumour DNA is important as it helps to show which mutations are inherited and aren’t new mutations that have developed in the tumour. And with such a large dataset, they can look for inherited mutations that have affected several patients. The team will produce a list of genes which they will investigate to see how each gene might contribute to the development of RMS. 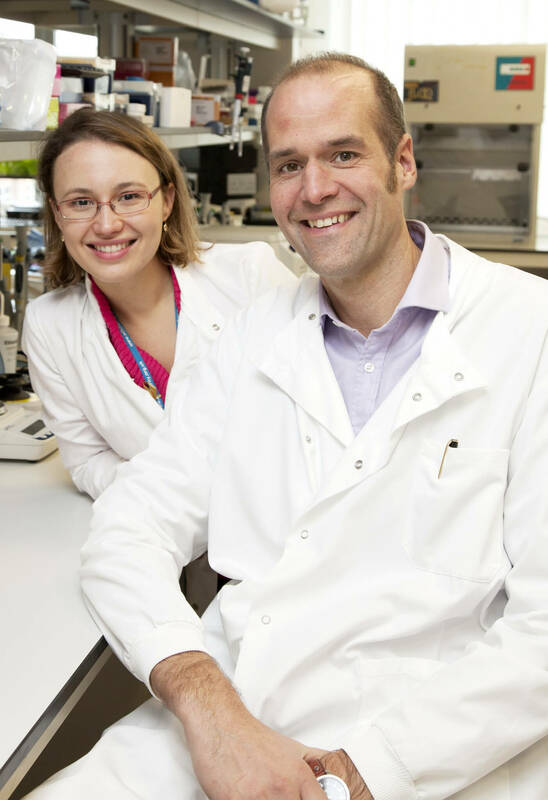 The team has developed a blood DNA test for the DICER1 gene to help to diagnose PPB tumours. As part of this project, they are continuing to design clinical tests for more genes that we know relate to other DICER1 syndrome tumours, as well looking for the genes most likely to be responsible for RMS. By investigating genes that make children more likely to develop RMS, the project aims to help doctors to concentrate on the children most at risk. This could help with diagnosis, therapy and possibly even cure for children in the early stages of RMS. Dr Marc Tischkowitz is a clinical geneticist who leads a University of Cambridge research group on hereditary cancer predisposition. He is an expert in the range of cancers associated with mutations of the gene known as DICER1 and works with other leading researchers in the UK, Europe, US and Canada. Supported by Dr Mae Goldgraben, Dr Tischkowitz will work with Dr Matthew Murray, a paediatric oncologist and expert in studies involving DICER1; and Professor Nicholas Coleman, a tissue pathologist with expertise in RMS. The Cambridge team is also collaborating with Professor Janet Shipley from The Institute of Cancer Research in London.